First of all, you need djay for Mac. You can either get it from the AppStore or from the Algoriddim site. There is a free trial, but I’m not sure what the limitations are. Even when djay is done, you’re not! 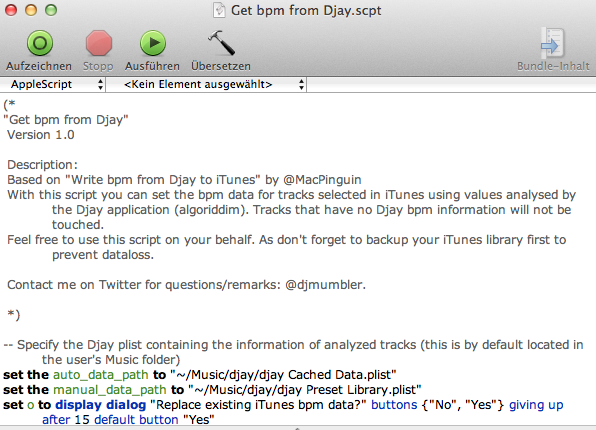 The problem is that djay stores the BPM data in its on database. Therefore we have to import the BPM data to iTunes. You need an apple script to do this. Get the first one from here! Wait for the download to finish (it’s just text, so it should be fast ) and then open the file. Your Mac will open it in the Apple Script Editor application. Here you can see what the script is actually doing – but don’t change it if you don’t know what you’re doing. When you click on ‘Run…’ it’s just like a regular program. It asks you if it should replace the existing iTunes data (it’s just the BPM value). Just say yes and wait for the magic to happen. Leave the iTunes selection as it is until the copying is done. 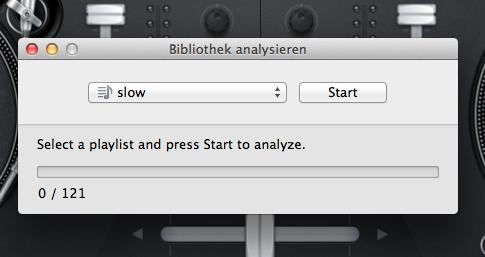 There you go – sort your songs by BPM and listen to it from slow to fast or fast to slow.